Recorded in various spellings including O'Halligan, Halligan, O'Hollegan, Holgan, and Olligan, this very interesting name is Medieval Irish. It is the anglicized form of the original pre 14th century Gaelic O' hAileagain', meaning 'a descendant of Aileagan', the later being a personal name derived from 'aille', meaning beauty. The clan O'Halligan is an Oriel sept from counties Louth and Armagh, and it is claimed have been recorded there as early as the year 1042. 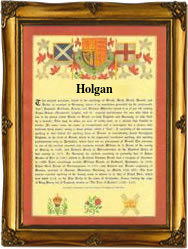 In the ancient rolls and charters the surname is recorded O' hAllagain, and later in the 17th century as O' Hallagan and O' Hollegan in North Connacht, as it is today, In Dublin the spelling seems to have been Holgan from early times, with Patricke Holgan, the son of Walter Holgan, being christened at St Michans church, on August 1st 1641. Other sample recordings in Ireland include : the christening of Margarett Halligan, the daughter of Turlagh Halligan, on February 14th 1655 at Derry Cathedral, Templemore, and the birth of James Halligan on May 24th 1864 at Monasterboice, County Louth. The first recorded spelling of the family name is possibly that of William O' Halegan, which was dated 1597, in County Kildare. This was during the reign of Queen Elizabeth 1, known as 'Good Queen Bess', 1558 - 1603. Throughout the centuries, surnames in every country have continued to "develop" often leading to astonishing variants of the original spelling.